TWM Educates Students about the Benefits of Land Surveying Technology - St. Louis Engineering Firm | Thouvenot, Wade & Moerchen | TWM, Inc.
June 2018 – TWM acted as the lead educators for one day of a week long Land Surveying Camp at Parkland College in Champaign, IL. Approximately 20 local students participated in the camp, with ages ranging from elementary to high school. The camp’s main focus was to expose kids at an early age to potential career paths using technology. 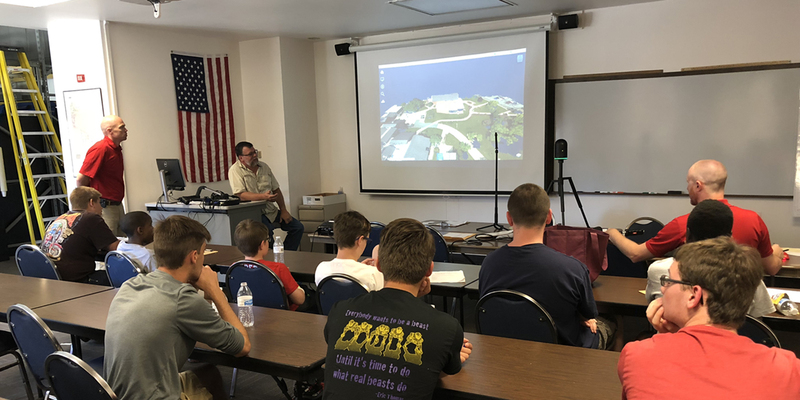 TWM’s Josh Hoffmann, Andy Joost and Derek Twente taught the classes, and noted many kids compared the technology to a video game called Scanner Sombre. During the course of TWM’s session, kids were able to use our drone, 3D Laser Scanner, and Total Station to capture data. Subsequently, they compared point clouds, scan data, and UAV data sets to assess the pros and cons of each technology. For example, the drone is less accurate, but can easily scan even the most difficult to reach or even dangerous areas. On the other hand, the Total Station captured the most accurate data, but was obviously much more time consuming than using the 3D Laser Scanner or the drone. TWM regularly attends career days at local schools, and believes the time is a worthy investment in educating future generations about the benefits and advantages to using technology in the workplace.